A rich yet lightly textured lotion that soothes and moisturises the skin while creating a surface protection system that helps defend against the elements. It helps promote exfoliation, producing younger more radiant looking skin. Regular use complements the skin’s own ability to care for, moisturise and defend itself. Allows for a smooth and even makeup application. This rich-textured cream replaces daily moisture loss while you sleep and smoothes the look of fine lines. Millenium reawakens fresher, newer, surface skin that conserves and uses its own vital moisture. Consequently, dryness lines relax and sleek out, so skin feels revitalized and looks radiant and glowing. 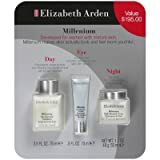 Developed for women with mature skin, Millenium makes skin actually look and feel more youthful. This emollient cream reinforces the Millenium benefits for the vulnerable area around the eyes. Its moisturizing forumla helps relieve dryness, leaving skin revitalized and renewed. Helps minimize the appearance of facial lines too. Millenium: Luxurious, pampering care for skin that looks and feels younger. Skin is constantly changing through the decades. For every skin, there is a turning point, when it begins to appear tired, dry and older-looking. But now there is an alternative… Millenium. Developed for women with mature skin, Millenium makes skin actually look and feel more youthful. Millenium reawakens fresher, newer, surface skin that conserves and uses its own vital moisture. Consequently, dryness lines relax and sleek out, so skin feels revitalized and looks radiant and glowing.